Create a snooker room in the garden. Do you like a game of snooker or pool? But, don’t have space in your house for a table? Well, how about creating a room in the garden tailored around your favourite game? 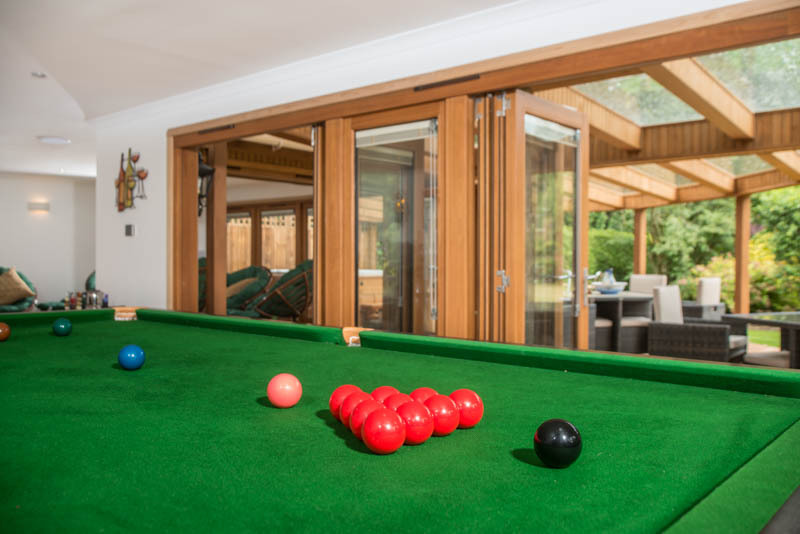 Over the years we have featured lots of family rooms and games rooms, but when we asked our garden room supplier contacts for examples of snooker rooms they had designed and built, we were blown away by how many people are creating a tailormade snooker room in their garden. The garden room suppliers featured below have worked closely with their client to create a room tailored to their favourite game and incorporated design features to create a room that works for them, the game and their guests. This modern games room by Bathstone Garden Rooms is a great example of how a building can be tailored to your needs and tastes. Learn more about this project by calling Bathstone Garden Rooms on 01189 842 555. Thought has to be given to the size of the garden room building so that there is enough room internally to house the table, with space all around to use the cue fully. If you were planning on a full size 12 ft x 6ft snooker table, for instance, to use a full-size cue you would need to create a room at least 22ft x 16ft / 6.7m x 4.9m. If pool is more your game and you opted for an 8ft UK table, using a full size cue you would need to create a room that is at least 17ft x 13ft 6ins / 5.2m x 4.1m – this is before you start adding in other furniture. These two buildings by Swift Garden Rooms are good examples of the type of garden room that could house a full size snooker table. The first one is 8m wide by 6.5m deep. The second is slightly smaller at 7.5m wide by 5.2m deep. As bespoke garden room designers the Swift team will design a building to your specific size. Contact Swift Garden Rooms on 01625 875 588 to learn more about a bespoke snooker room. Ark Design Build based in Kent, tell us that they would charge around £29,000 including VAT for a garden room 6.5 m wide by 4.5m deep, suitable for a snooker table. This price includes installation and would create a modern, highly insulated room designed for year round use. To learn more talk to the Ark Design Build team on 07760 882 950. Many garden room suppliers will be able to tailor the size of the building to your specific needs. A bespoke designer will be able to tailor the measurement to the nearest millimetre, while modular specialists tend to work with 4ft, 2ft, etc. modules. As you can see from the photos that follow, snooker rooms can be designed in a traditional style or something much more contemporary, again depending on your tastes. Extra Rooms are another firm who have created a snooker room with a vaulted ceiling. Their design has a much lower pitch roof than the Garden Affairs example above, yet retains the charm of having the roof trusses exposed. Extra Rooms design, has the feel of a traditional snooker hall with the cues mounted on the wall, a scoreboard and traditional lighting over the table. To learn more about this snooker room talk to the Extra Rooms team on 01159 899 555. Timeless Garden Rooms are bespoke designers who create wonderfully detailed traditional style garden rooms. The interiors of their rooms have a lovely light, and airy feel as these images of a pool room they created show. The Timeless team are currently building a snooker room; we will hopefully feature this soon. To learn more about creating a snooker room full of traditional charm talk to Timeless Garden Rooms on 01843 821 851. This pool room example by Green Studios is much more contemporary in feel. Designed for a London garden the pitched roof garden room is flooded with natural light thanks to the large expanse of glazing on the front wall and the addition of two roof windows on the rear roof pitch. The pool table sits at one end of the room with space for a sofa and flat screen TV at the other end. The addition of a basketball hoop outside makes this garden room a fun recreation space. 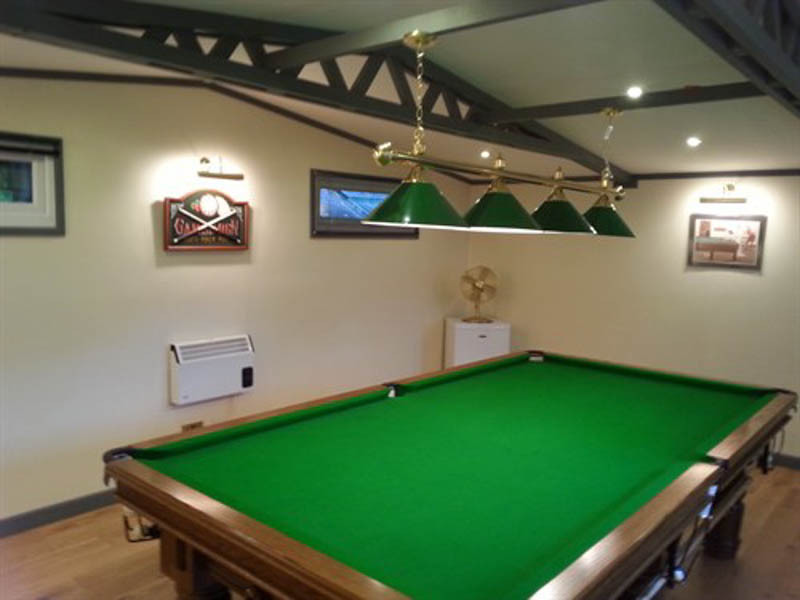 To learn more about this modern games room, talk to Green Studios on 01923 205 090. Sanctum Garden Studios are another firm who work in a contemporary style. This games room that features a pool table, has a cubed roofline, creating a building with simple straight lines. The bi-fold doors that run along the front elevation can be folded back to create a great connection between the inside and outside space. To learn more about building a contemporary style games room talk to Sanctum Garden Studios on 01204 460 450. Your intended use will be taken into consideration when designing your garden room, as it will have an impact on the structure, layout and design features. For example, if you are going to house a snooker table with a slate bed, extra thought will need to be given to the foundation and floor structure. Both elements would need to be reinforced, compared with normal garden room levels, to take the loads involved. Levelling the foundation and the floor is key in any garden room build, but with a snooker room particularly, attention will be paid to ensure level precision. When buying a garden room, you have the opportunity to design in all the features you fancy. Your designer will work with you to create the right lighting system for your room. This can include different colour LED lighting to create the right mood and focus lighting over the snooker table itself. You might want to incorporate surround sound speakers so that you can have the BBC snooker theme playing as you start a game! It is becoming increasingly popular to incorporate a kitchen and toilet or shower room into a building like this. This makes entertaining easy and comfortable for everyone. Crown Pavilions are experts at incorporating designer features into their luxury cedar garden rooms. These photos, for instance, show a snooker room with its own bar! The L-shaped room with covered seating area connecting the two wings has created a great entertaining space. To learn more talk Crown Pavilions on 01491 817 857. As you can see these garden room designers have a lot of experience creating snooker and pool rooms. Contact them directly to discuss the options for your own tailormade design.